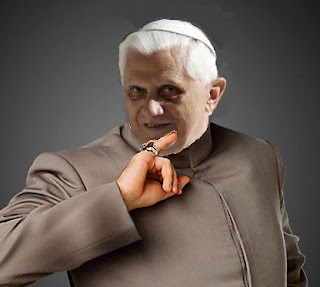 With his sunken eyes, sallow complexion and soft, slightly lisping Bavarian accent, Pope Ratzinger makes a convincing avatar of Dr Evil. He has a name which Ian Fleming would have been proud to have invented, a mysterious if much-exaggerated Nazi past, and runs his own private country. Rumour has it he even likes cats. It is however as an arch-conservative, almost a throwback to the middle ages, that he is likely to be best remembered: a man suspected of wanting to restart the crusades, or even, according to a claim by the Vatican's exorcist, recruit a new army of demon-hunters. Over the past couple of weeks, two new stories have appeared to consolidate the myth of Ratzinger the obscurantist. He was forced by protests to abandon plans to deliver a lecture at one of Rome's oldest universities, and reports suggested that he had a new target on his pontifical radar: Harry Potter. The violent manipulation of things and people comes thanks to knowledge of the occult. The ends justify the means because the knowledgeable, the chosen ones, the intellectuals know how to control the dark powers and turn them into good. This a grave and deep lie, because it is the old Gnostic temptation of confusing salvation and truth with a secret knowledge. The characterisation of common men who do not know magic as 'muggles’ who know nothing other than bad and wicked things is a truly diabolical attitude. In fact, Rialti's piece was not an official Vatican statement, and was actually published as part of a debate on the books: a contrasting pro-Potter article, written by the literary historian Paulo Gulisano, appeared alongside it. And there have been other Catholic defences of the young wizard. Massimo Introvigne, who heads the Centre for the Study of New Religious Movements, has written about the obvious Christian allegory contained in the final Potter book, Deathly Hallows, which he compares to that found in the works of Tolkein and, especially, C.S. Lewis. Harry Potter, who endures his own Via Dolorosa, becomes an explicitly redemptive figure, and the substance of a long speech in which the ghost of Dumbledore speaks to him is a paraphrase of John Chapter 15: No greater love has any man than this, that he should lay down his life for his friends. Any discussion of the content of Harry Potter cannot ignore the criticism from religious circles, which saw a potential vehicle for dissemination of magic and occultism: an author in Germany, who put forward these objections, even received a letter of encouragement from Cardinal Ratzinger. a vague answer which suggested to some sceptics that Ratzinger had read neither the Potter books nor Ms Kuby's attack on them. Nevertheless, when Ratzinger became Pope the story resurfaced, and here it is again. Not only Dr Evil, but also Voldemort. held and believed the doctrine which is false as being contrary to the divine Scriptures, that the sun is the centre of the world and does not move from west to east and that the earth moves and is not at the centre. condemned centuries of scientific and cultural growth by affirming anachronistic dogmas such as Creationism while attacking scientific free thought and promoting mandatory heterosexuality. Given all this, Ratzinger's attacks on Islamic fundamentalists look a little strange. They would seem to have a lot in common. Meanwhile the Pope's famously devoted personal secretary Mgr Georg Ganswein has been talking to Catholic World News about his priestly vocation. "I cannot marry, but I know love." he explained. Whatever can he mean? Great article and picture of our Holiness (gag reflex, bile in throat, yuck). Keep up the good works. Here's some pivotal knowledge (wisdom), use it well in the upcoming conflagration. Religion is FlimFlam spirituality !!! It is beyond amazing that these "snakes in fancy clothing" still have the gall to continue to defend the abomination that was/is the Inquisition. Now we have a Grand Inquisitor Pope (Glory of the Olives…) who personally defends some of the Vatican-Papacy's most heinous and despicable activities. Why does anyone need anymore proof that these "people" are lying through their teeth to save their own skins? Christianity has been decisively proven to be a Roman deception, and they know the end is nigh!! Here is comprehensive proof that the symbolism of many ancient texts, canons, and concepts is an advanced and extremely ancient spiritual & philosophical technology that predates all extant religions and mystery schools. Consequently, here is proof, beyond disproof, that all three so-called "Faiths of Abraham" are purposeful deceptions. What would you do if given the pivotal wisdom required to drive a stake through the heart of these evil bloodsuckers' hidden power sources? Oh what wonderful publicity for the Potter books. Please, give us much more of it! Let the academics, those who are desperate for a bit of limelight, play their little fatuous games. It will strengthen the boy- wizard all the more. These men, so called god/christ figures are spouting such humbug in so many directions, they feed the search for alternative educated,intelligent interests.